Two state legislators are running to represent a demographically changing senatorial District 10: the incumbent, Democrat Sen. Wendy Davis, and Republican state Rep. Mark Shelton. Davis, who defeated an entrenched incumbent four years ago, did not take long to make her mark on the Senate, enhancing the populist image she honed as a forceful but consensus-building member of the Fort Worth City Council. During her first term in Austin, she emerged as one of the best-known and most respected Democrats in the Legislature and, as a result, the most targeted by the political opposition. Davis is a successful attorney with a powerful personal narrative, the story of a woman who overcame obstacles to achieve at the highest level. At 19, she was a single mother who began to work her way through school beginning at what is now Tarrant County College, eventually earning a law degree from Harvard with honors. Because she understands the value of education, she fought hard in the last legislative session against large funding cuts for public schools and universities, filibustering a bill that ultimately resulted in the state losing more than 28,000 education jobs. Davis has also been a champion of women’s health issues, consumer protection and a bill to replenish funds for the Children’s Health Insurance Program, legislation her opponent — a physician — voted against. I’d quote the whole thing if I could. It’s as strong an endorsement as you could want, in the most important single race in the state. 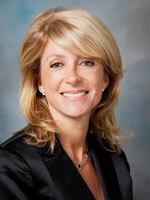 Go read it, and show your support for Sen. Wendy Davis. You may also have noticed the Chron’s embarrassing endorsement of Mitt Romney on Sunday. I say “embarrassing” because I have to wonder if the Chron’s editorial writers have been reading their own editorials, never mind following the Presidential campaign. They criticize cuts to Planned Parenthood, but endorse the candidate who would “get rid of” Planned Parenthood. They advocate for expanding Medicaid in order to reduce the number of uninsured people in Texas, yet they endorse the candidate whose promised budget would devastate Medicaid and whose promised repeal of Obamacare would leave millions more uninsured and without access to health care. One wonders if they’re too dumb to understand the issues they claim to support, too easily bamboozled by Romney’s ever-shifting positions, or just too hidebound to overcome their historic preferences. Whatever the case, it’s not one of their prouder moments. One last thing: The Chron’s page that lists all their endorsements includes a few races for which they have not written an endorsement editorial yet. Those races are CD14, in which they endorse Nick Lampson; HD134, in which they recommend Ann Johnson; and Harris County Tax Assessor, in which they go with Mike Sullivan. I presume we will see the editorials for these this week. Whether they will endorse in other legislative and/or Congressional races, I couldn’t say. Have to agree with your comment regarding Chron’s endorsement for president. Maybe they came down with a case of Romnesia themselves.